Pata at Madison Square Garden, New York, 2014. Tomoaki Ishizuka (石塚 智昭, Ishizuka Tomoaki, born November 4, 1965 in Chiba), known exclusively by his stage name Pata, is a Japanese musician. He is best known as the rhythm guitarist for the heavy metal band X Japan. He joined the band in 1987, stayed with them until their dissolution in 1997 and rejoined when the band started a comeback in 2007. A year after their breakup, he formed the short-lived duo P.A.F. with singer NoB and created the band Dope HEADz with X Japan bassist Heath and former Spread Beaver percussionist/programmer I.N.A. in 2000. Right after they ceased activity, Pata formed the instrumental band Ra:IN in 2002, which still tours extensively to this day. His stage name is taken from the manga Patalliro!, as he was said to resemble the title character. Little is known about Pata's early years as he tends to keep his past and personal life to himself. He taught himself to play guitar on a Fender Stratocaster. He formed his first band in 1980, and two years later created the band Black Rose, later known as Judy, but chose to disband it in 1985 or 1986. Prior to disbanding, Yoshiki filled in on drums at several performances. Pata actually asked Yoshiki to join Judy, as at the time X Japan was going through member changes, but he declined. According to Yoko of United, Pata was a roadie for brief X member Hally and used Hally's guitar when he joined X himself. Pata first played with X Japan (then named X) in 1987 as a session musician, on the songs "Stab Me in the Back" and "No Connexion" for the sampler Skull Thrash Zone Volume I. After supporting them at a couple live shows, he officially joined the band later that year. They released their first album Vanishing Vision in 1988 and toured extensively in support of the record. They would become one of the first Japanese acts to achieve mainstream success while on an independent label, and later widely credited as one of the pioneers of visual kei. X 's major label debut album, Blue Blood, was released in April 1989 and debuted at number six on the Oricon chart. Its success earned the band the "Grand Prix New Artist of the Year" award at the 4th annual Japan Gold Disc Awards in 1990. Their third album Jealousy was released in 1991 and debuted at number one, selling over 600,000 copies. It was later certified million by the RIAJ. Shortly after the release of 1993's Art of Life, which also topped the Oricon, the members of X Japan took a break to start solo projects. Dahlia, which would become the band's last album, was released on November 4, 1996 and once again, it reached the number one spot. In September 1997, it was announced that X Japan would disband, they performed their farewell show, aptly titled The Last Live, at the Tokyo Dome on December 31, 1997. Pata with Ra:IN at Japan Expo in 2008. In 1993, while still in X Japan, Pata released his first self-titled solo album, which featured many veteran American musicians such as Tommy Aldridge, Tim Bogert, Mike Porcaro and James Christian. His second, Raised on Rock, was released two years later and again featured Christian, as well as Chuck Wright and Ken Mary. He also played at a number of concerts for fellow X Japan guitarist hide's solo career from 1994 to 1998. A year after X Japan's breakup, he formed P.A.F. (standing for "Patent Applied For", named after the PAF guitar pickups) with singer NoB. In about one year's time they released: two albums, one mini album, one live album and two singles. For the 1999 hide tribute album, Tribute Spirits, Pata teamed up with X Japan's bassist Heath and former Spread Beaver percussionist/programmer I.N.A. to cover the X Japan song "Celebration". He would reunite with them again in 2000 when they formed Dope HEADz, adding vocalist Jo:Ya. They released two singles and an album, when in 2002 they recruited new singer Shame and released Planet of Dope. Soon after its release they would cease activity. The same year he formed the instrumental rock band Ra:IN (standing for "Rock and Inspiration"), with bassist Michiaki and drummer Tetsu (he later having previously played with him in P.A.F.). In 2007, after three albums, former Spread Beaver member DIE joined Ra:IN as keyboardist. They tour extensively, having performed quite a few overseas shows, including a lengthy European tour in 2009. In 2003, Pata played live support for Miyavi at a couple of his concerts, along with former Spread Beaver bassist Chirolyn, Seikima-II guitarist Luke Takamura and Luna Sea drummer Shinya. In 2005, Pata appeared on Nanase Aikawa's album R.U.O.K.? !, as did DIE, Shinya, Dead End bassist Crazy Cool Joe and former Megadeth guitarist Marty Friedman, they all supported her on the album's tour. According to a report by the newspaper Sponichi, X Japan vocalist Toshi visited drummer Yoshiki in Los Angeles in November 2006 to work on a song as a tribute to hide. In March 2007, Toshi announced on his website that he and Yoshiki had recently resumed working together, stating that a "new project" would commence soon. Rumors of a X Japan reunion subsequently began, and in June Yoshiki was reported as having expressed interest in a tour and that he was in talks with Heath and Pata regarding their participation. On October 22, 2007, X Japan announced their reunion and released the Saw IV theme song, "I.V.". In 2010, they went on their first North American tour from September 25 to October 10. Their first world tour began with four gigs in Europe from June 28 to July 4, 2011 and was resumed from September to October with five shows in South America and five in Asia. On September 22, 2013, Pata appeared at a concert in memory of hide, hosted by Sexxx George (Ladies Room), performing in a special band with George, Eby (ex-Zi:Kill), Yoshihiko (heidi.) and Cutt. For the hide tribute album Tribute VII -Rock Spirits-, released on December 18, 2013, Pata reunited with Spread Beaver members Joe, INA and Chirolyn and Dope HEADz vocalist Shame to record a new version of "Pink Spider" under the name The Pink Spiders. On January 15, 2016, Pata was rushed to the intensive care unit of a Tokyo hospital. He was diagnosed with colon diverticulitis and a severe blood clot in his portal vein, but in stable condition. In June, Yoshiki stated that Pata was discharged in March, but had to go back for surgery in August. Pata announced he was discharged on August 10. X Japan ended up postponing their album release and March 12, 2016 concert at the Wembley Arena in London for a whole year; the latter being held on March 4, 2017. Pata playing his 1955 Les Paul, nicknamed "Hage", in 2009. Pata is noted as the only member of X Japan who plays American-made instruments, almost always seen playing a vintage Gibson Les Paul; most often a yellow 1959 Les Paul Standard in the past. However, more recently he uses a 1955 goldtop that is now rubbed down to the wood, earning it the nickname "Hage" (ハゲ, "Bald"), or a black 1972 Les Paul Custom. In addition to his lineup of Les Pauls, Pata sometimes utilizes a Gibson EDS-1275 double neck guitar and earlier in his career, a rare 1958 Gibson Explorer was used occasionally. He had a signature model based on the Explorer with Japanese Gibson replica maker Burny, the EX-85P. ^ a b c d e "Interview: PATA of X JAPAN". JRock Revolution. Archived from the original on 2008-04-12. ^ a b "Guitar battle with Hide and Pata". GIGS. January 1992. ^ a b c d "Indies eXplosion: The Early History of X JAPAN". JRock Revolution. 2007-10-29. Archived from the original on 2015-07-01. Retrieved 2013-03-07. ^ "UNITED – Thirty Years Of Thrash And Burn". carlbegai.com. 2011-12-23. Retrieved 2016-05-09. ^ "SKULL TRASH ZONE I". japan-discoveries.com. Retrieved 2011-11-08. ^ Yang, Jeff; Can, Dina; Hong, Terry (1997). Eastern Standard Time. Boston: Houghton Mifflin. p. 264. ISBN 0-395-76341-X. ^ Minnie, Chi. "X Japan Best review". Asia Pacific Arts Online Magazine. Archived from the original on 2012-01-25. Retrieved 2013-02-27. ^ Strauss, Neil (18 June 1998). "The Pop Life: End of a Life, End of an Era". The New York Times. Retrieved 2013-02-27. ^ a b c X JAPANのアルバム売り上げランキング. Oricon (in Japanese). Retrieved 2013-02-27. ^ "The Japan Gold Disc Award 1990". golddisc.jp (in Japanese). Retrieved 2013-02-27. ^ "Oricon Weekly Album Chart for the third week of July 1991". Oricon (in Japanese). Retrieved 2013-02-27. ^ "RIAJ CERTIFIED MILLION SELLER ALBUMS". ocn.ne.jp. Archived from the original on 2012-08-05. Retrieved 2013-02-27. ^ Pata album liner notes, 1993. ^ a b "Profile" (in Japanese and English). Pata Official Website. Retrieved 2017-04-25. ^ "PATA - Raised on rock". Discogs. Retrieved 2013-05-04. ^ "hide TRIBUTE SPIRITS". Amazon.co.jp (in Japanese). Retrieved 2011-11-08. ^ "hide TRIBUTE SPIRITS". hide official website (in Japanese). Retrieved 2017-04-12. ^ hide初のドキュメンタリームービーhide 50th anniversary FILM「JUNK STORY」にYOSHIKI(X JAPAN)のインタビュー出演を発表！ (in Japanese). Sankei Shimbun. 2015-05-03. Retrieved 2017-04-12. ^ "Interview with Ra:IN". JaMe World. 2011-08-02. Retrieved 2017-04-25. ^ 元X-JAPANのPATA率いるバンドが１年半ぶりにワンマン開催！ (in Japanese). Barks. 2007-10-06. Retrieved 2017-04-25. ^ "R.U.O.K.?!". Discogs. Retrieved 2011-11-08. ^ a b "X Japan Reunites for New Single, Tour". blabbermouth.net. 2007-06-02. Archived from the original on 2007-08-12. Retrieved 2013-02-27. ^ ""New Project" announcement". iyashi-no-concert.com. Archived from the original on 2007-12-13. Retrieved 2013-02-27. ^ "Official announcement of X Japan's Aqua City performance". 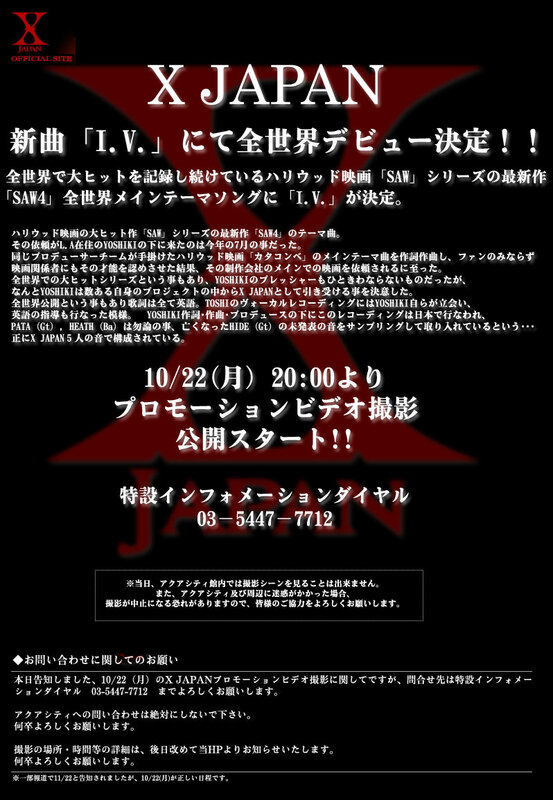 xjapan.ne.jp (in Japanese). Archived from the original on 2007-10-23. Retrieved 2013-02-27. ^ "X Japan confirms North American tour details". The Independent. London. August 19, 2010. Retrieved 2013-02-27. ^ "X Japan World Tour – London, Paris, then Berlin". bionicbong.com. Retrieved 2013-02-27. ^ "X JAPAN's World Tour to extend into South America". tokyohive.com. Retrieved 2013-02-27. ^ "X JAPAN puts on a spirited show at 'SUMMER SONIC'". tokyohive.com. Retrieved 2013-02-27. ^ "hide Still Alive! 2013 at Kashiwa PALOOZA". Rokkyuu Magazine. Retrieved 2013-11-07. ^ "hide Tribute VII -Rock SPIRITS-". cdjapan.jp. Retrieved 2013-12-15. ^ ＰＡＴＡ救急搬送でＸ　ＪＡＰＡＮ活動休止…ＹＯＳＨＩＫＩ「見守るしか」. Sankei Sports (in Japanese). 2016-02-04. Retrieved 2016-02-03. ^ "X Japan Goes on Temporary Hiatus After Pata's Hospitalization". Anime News Network. 2016-02-03. Retrieved 2016-02-03. ^ 「X－JAPAN」PATAが退院「工事完了！」大腸憩室炎などで手術. Sports Nippon (in Japanese). 2016-08-12. Retrieved 2016-08-15. ^ "X JAPAN Forced To Postpone Shows Due To Guitarist's Illness". Blabbermouth.net. 2016-02-03. Retrieved 2016-02-03. ^ Benjamin, Jeff (March 10, 2017). "Inside X Japan's long-awaited Wembley Arena concert". Fuse. Retrieved March 10, 2017. ^ PATAがギターを紹介（ハゲ・常務くん・ダブルネック・ストラト）. Youtube. Retrieved 2017-04-25. ^ ＢＵＲＮＹ　ＥＸ－８５Ｐ (in Japanese). Geocities. Retrieved 2017-04-25. ^ a b PATAのシングル売り上げランキング oricon.co.jp. Retrieved 2011-01-01. ^ a b Dope HEADzのシングル売り上げランキング (in Japanese). Oricon. Retrieved 2011-01-01. ^ a b Dope HEADzのアルバム売り上げランキング (in Japanese). Oricon. Retrieved 2011-01-01. Wikimedia Commons has media related to Pata (musician). This page was last edited on 15 February 2019, at 22:19 (UTC).